A Sales Program by any other name could still be complicated. Sales commission programs are possibly the most variable programs managed by any firm. We at NAV-X always say that unlike accounting regulations (FASB and GAAP), there are no GASP (Generally Accepted Selling Principles). Often this leads to Sales Managers, Accounting liaisons, and others “grasping” to gather, sort, total, refine, and calculate commissions on a regular basis. Because commission programs vary significantly from industry to industry, and company to company; NAV-X created its Commission App. It provides for the agile, and robust requirements to manage and calculate Internal reps, external reps, split commissions, by Items, Volume, Profit, Campaigns, and much more. NAV-X Commission is a powerful, flexible Sales Commission Software. It calculates your sales people’s compensation accurately and reduces errors related to spreadsheets and manual methods. NAV-X Commissions allows you to control your incentive program in real time. So instead of “gasping,” for help; we give you the “gas” you need to push your company towards higher profits. 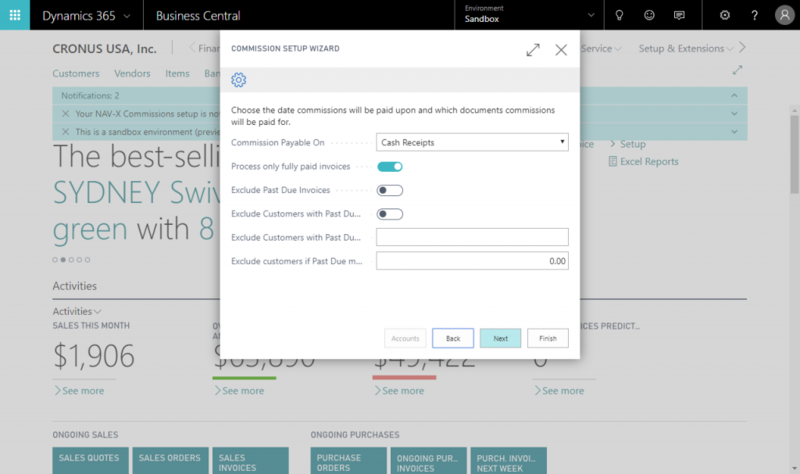 Dynamics 365 Business Central, Dynamics NAV 2018, 2017, 2016 and 2015. NAV-X is here to help you increase your productivity.